Successful production of high quality and specialty peaches in western North Carolina represents a profitable opportunity for growers wanting to diversify farm income. Grower gross returns of $6-8,000/acre are possible and may increase based upon grower commitment and targeted markets. New cultivars developed at NC State University have the potential to overcome the region’s typical problems with freeze/frost damage to peaches. 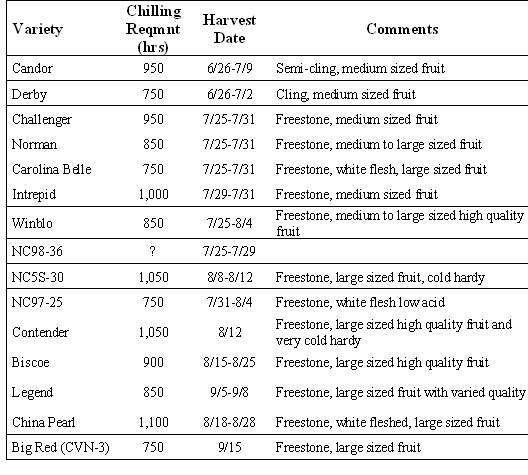 These high-chilling cultivars are being tested in addition to cultivars with other characteristics that are desirable to consumers, such as low acidity and unique shape and flesh color. Locating and purchasing high-quality tree-ripened peaches has become very difficult. The lack of availability of high-quality peaches for the consumer has resulted in a decrease in the consumption of fresh peaches to approximately 4.5 lb. per person. Peaches being sold at large retail chain outlets are primarily from the west coast or the Southern hemisphere, and have been picked immature and shipped long distances. While very pleasing in appearance, this inferior quality fruit is purchased by consumers who are thereafter not likely to buy another peach. Therefore, the production of high-quality peaches to be sold in local retail outlets and roadside stands in NC provides the potential for large returns to the growers and a reversal in the declining per capita consumption of peaches. 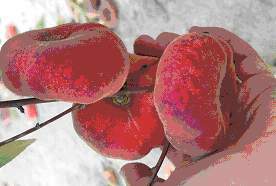 In addition, there is great demand for unique characteristics such as low acidity, white flesh, and doughnut-shaped peaches. Peach production has historically been difficult in western North Carolina due to frost/freeze crop loss. NC State University has released several cultivars over the past decade that are high-chilling and have the potential to crop in years when other cultivars are eliminated by cold spring temperatures. This research was designed to identify cultivars that have desirable characteristics for production and marketing in western NC. In 2001, 15 cultivars of peaches were planted at the Mountain Horticultural Crops Research Station in Fletcher, North Carolina. These were primarily North Carolina released cultivars of both white and yellow-fleshed varieties. Seven additional selections were planted in 2002 with superior traits such as cold hardiness, white flesh, low acidity, late ripening, or doughnut shape (“peento” type). Trees are grown under commercial conditions and not irrigated for frost protection to evaluate the cropping consistency of these cultivars. This year there was a crop on the 15 cultivars and selections that were planted in 2001 (Table 1). The season started out with a frost/freeze event during bloom and a hail storm later in the Spring which reduced the crop load on some of the varieties. 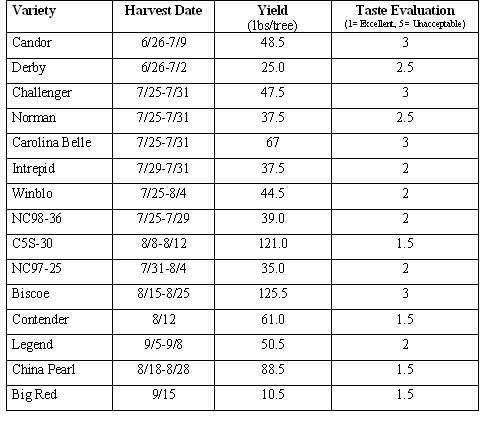 Although it is too early to make any recommendations from what is occurring in this plot, we are encouraged with the performance of several of the cultivars (Table 2). 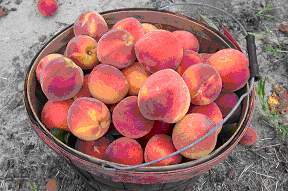 Biscoe and China Pearl were two of the named cultivars with the greatest yield in 2003 and both were rated very favorably by those taste testing the peaches. The selection C5S-30 also cropped heavily in 2003 and was rated excellent in taste testing. On the other hand Big Red had a very small crop and needs to be evaluated further in western North Carolina. Tree growth and survival has been exceptional and the flower bud set for 2004 looks very promising. No research-based conclusions can be made at this time given the time required to get peach trees into production. However, peaches provide a profitable opportunity for small and/or diversified farmers in western North Carolina. In 2004, a presentation was made to the Henderson County Apple growers, a pruning demonstration was held in March, and a tour is planned for the summer. Table 2: Harvest date, tree yield and taste evaluations of the 2003 peach harvest at the Mountain Horticultural Crops Research Station.